One cannot deny the fact that interviews are tricky and makes us nervous, no matter how many interviews you face one could never know the expected questions. Gone are the days when organizations used to follow traditional interview procedure. Now they have unexpected questions for candidates. ‘How will you sell my laptop to me? ’, and so on. Questions like this test the wit and creativity of the person. Another question of such kind is ‘ what is your happiest moment ‘, though the question sounds easy to answer it does make candidates confused, if he or she is unprepared. The open ended questions is your opportunity to shine and impress the interviewer, it gives you a chance to demonstrate your skills and portray yourself as the apt candidate for the position. So will you let this golden chance slip away from you by answering this question casually? Let’s look at the ways one can answer this questions perfectly. 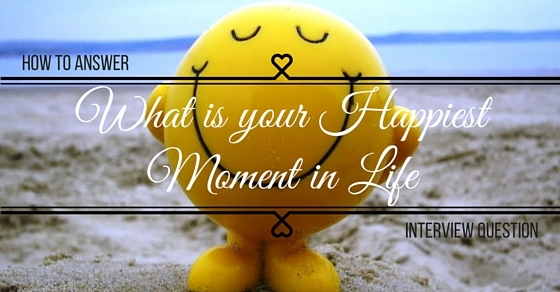 1) Why is the Question’ Happiest Moment of Your Life’ Asked to the Candidates? One might wonder why is this question asked. Candidates expect the straight forward questions about their qualifications, work experience, accomplishments and skills. Very often they are well prepared to face questions on these topics. But organizations look for something beyond the work experience. Job fit: Can he do it? Cultural Fit: Is he a good fit for the culture of the company. For gaining this large information, interviewer needs to ask questions which will brood in deeper and get them greater insights of the person. One would have never thought that the simple question can reveal so much of information. As it is revealing many important aspects, it is necessary to prepare for this answer well. Unless you want to mumble something silly, which has no such positive impact? 2) Which Moment can one Describe in the Answer? A person has several happy moments in life. When this question is asked, many childhood memories come rushing to mind. Several moments’ like- parents praising us for good grades, getting a scholarship, winning basketball match, graduating successfully, getting first job, getting first salary, getting married, birth of first child. All such instances can be said as happiest moments in life. But do you think answering in one line, can benefit you in any sort? You will not be satisfied with the answer and neither will the interviewer be happy. So the question remains, which incident to speak about and how. Candidates can elaborate on the accomplishment they already mentioned on the resume. One can also speak of a topic totally out of the resume and take the interviewer by surprise. Very often talking something not mentioned on resume grabs the attention of the interviewer. Because that’s exactly the thing he seeks. • Why do you regard it as the happiest moment? • How did it affect your life? 3. It is advised not to try too hard to test the psychology of the interviewer as you make it appear to be giving too obvious and unnatural answer. 5. Choose the situation which can make you look good, which will highlight your qualities and the instance which actually made you really happy. 7. Talk on a recent and profound moment that actually became the happiest moment for life. Let us discuss different answers, which can be given and the impact it can have. As discussed earlier, we should not speak of a situation of ages ago, so passing an exam instance cannot suit an individual with 5- 10 years of experience, this instance is suitable for a person searching for his first job and is fresh out of college student. ‘ Unlike others, my life too had many happy and sad moments, but to think of the happiest, I could remember an instance that happened a few months ago. I was waiting for my IT engineering results, I was not having high hopes as I fell ill during my exams. I was suffering from high fever and could hardly study much before exams. My mother was worried for my health and my results, but my father who has always taught me to be disciplined and prepared, had faith that I would pass with flying colors. And he was not wrong, I myself, never believed in last minute studies and use to revise the lessons the day it was taught. I practiced the difficult programs of Java language, as I use to find it difficult to grasp. To my surprise, My father was right, I passed with flying colors. And my parents felt proud of me. The Subject which I felt was difficult I scored a distinction in it. Seeing my efforts being paid off well and looking at my parents happiness, I was completely happy. I consider that as one of the happiest and best moment in life. The situation is personal and the way of describing it is casual, the situation is presented well. One can use the strategy of describing this answer in ‘ Situation- Task- action- Result’ form. Do not ramble a lot, make sure you finish the answer in a minute or two. This situation can be suitable for people with 0-2 year of experience. For candidates with high experience this would not be suitable. Describing some notable accomplishment will be ideal. ‘ While thinking of happiest moment, I can recall the incident when I received my first salary, I was out of high school and was trying to get good college. Till the college starts I had a vacation of few months. Instead of just relaxing, I thought to do something useful that vacation. Luckily I got a task of my interest and a good opportunity to put my skills to use. Since childhood I was fond of designing and computer graphics. My curiosity lead me to learn few lessons from internet and I acquired pretty decent skills in Photoshop and illustrator. I got a freelance job, which has a responsibility to design the company logo and the company website. I was very excited and worked with vigor. I got a feedback that am very creative and apt in understanding the requirement and giving results on time. They did not expect such good job from an undergrad. I was on seventh heaven to get a positive feedback and was one of my happiest moment, it made me motivated. I learned that self learning is the best way to learn and I have continued the same through out my graduation. Hence if I compare myself to my batchmates I am having ample skills which make me proud and confident about myself. The candidate tried to portray his skills, and the fact that he has passion and motivation to learn things by himself. He also mentioned the good reviews he got from the freelance jobs. And lastly as he said he had been learning on his own during the graduation gives an impression that the candidate has immense desire to learn. One should describe the incidents in short and should not come off as a show-off and an over confident person. Getting married is a life changing event, not all stories are fairy tales, many couples face several challenges and hurdles and finally they are together. Though it is a personal thing, it cannot be termed inappropriate to answer. The best way to describe can be as follows. ‘ I recently got married and that I consider being the happiest moment of my life. It’s a very life changing event . My husband’s name is Eric, we were together in college. We were deeply in love, but sadly due to our studies we had to stay apart. Even with the long distance, we made things work. We use to work overtime save money and travel to visit each other. The short time we had together was very precious. It was very difficult to stay apart but we knew focusing on studies and getting a good job is also important. Post we got jobs, the struggles did not end, and our parents were not very happy with our union and were disappointed due to our religious beliefs and financial status. But luckily love conquered as we convinced them together for long 2 years. Our parents realized our strong bond and hence got us married. Getting married surpassing so many struggles felt wonderful and that I consider the happiest moment of my life. I always get things which I set my heart on, and letting go Eric was definitely not on list. One has to sense the psychology of the interviewer, you cannot answer in such way if you think the interviewer is more of a traditional and would not appreciate an instance of a personal life. But if the interviewer is bit casual and relaxed then describing this instance can surely have positive impact. You are portraying that you are a hard worker, have focus and can handle many challenges. This quality is necessarily required in fast paced organizations. Another life changing and happy event one has in life is owning a house. It can surely be described in a way that impress the interviewer. Let’s see how. ‘ Since the time I was a kid, I dreamed of building a nice house. We use to live in suburb areas in small rented places where the rent was cheaper. We were not financially well off. It was a struggle for the large family of six to live in a small two room apartment. But the struggle made me stronger and I was determined to study harder, work harder and give my family the home they deserve. Nothing deterred my spirits and I worked hard for 8 years, I started working young at the age of 20. And with 8 years of hard work, I can proudly say that I own a 2 storey large home for my family. I never saw my parents that happy, they were in happy tears and appreciated my hard work and blessed me. This incident was one of the best moments of my life. The candidate told his life story in short, one has to assure that they are not rambling too much and getting emotional. Speak with a neutral tone and describe the incident in a normal tone. This incident portrays, that the candidate is hard worker and strived a lot to get his dream. An interviewer who is looking for an ambitious person will surely be impressed with this answer. So here we saw in detail how to answer this tricky question and the impact it can have. One should not aim to make up stories to impress the interviewer, but should work upon the way to present the instance in a precise and ideal way. Be genuine and answer in confidence and you will surely ace up answering this question. I am eager to know what other happy moments you all readers have faced in your life. It would be fun to share, isn’t it. Awaiting useful inputs and great stories.